How Long Does a 100 Pound Fireplace Propane Tank Last? A propane-fueled fireplace offers the warmth and ambiance of a wood-fueled fireplace without the labor and mess of burning wood. If you want a separate fuel source for your gas fireplace but don't have the room to install a large propane tank, a 100-pound propane bottle can offer you many hours of fire enjoyment. But how long your bottle lasts will depend on your fireplace's fuel consumption rate and how often you use it. Your fireplace burner should have information on a label or in a manual telling you the British thermal units, or BTU, it uses per hour. Or you can obtain this information from your fireplace dealer. The BTU figure is the starting point for figuring how long your 100-pound propane bottle will last. Propane sales can be confusing. Propane, also known as LP gas, isn't sold by BTU. It is sold either by the pound or by the gallon. So you need to convert your fireplace's BTU usage into pounds or gallons of propane consumed for each hour your fireplace is in use. 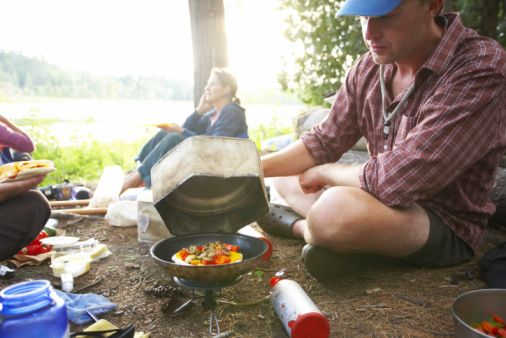 The 100-pound propane bottle is the biggest portable propane tank you can buy. It weighs 71 pounds empty and holds 100 pounds (24 gallons liquid) of liquefied propane. This compact bottle stands 46.5 inches tall, is 15 inches in diameter and weighs 171 pounds when full. It will produce 2.16 million BTU of heat. The BTU figure is useful because you can apply BTU ratings to your propane fireplace to find out how much fire time your bottle will give you. The length of time your 100-pound propane bottle lasts will depend on your fireplace's fuel consumption and how much you use it. 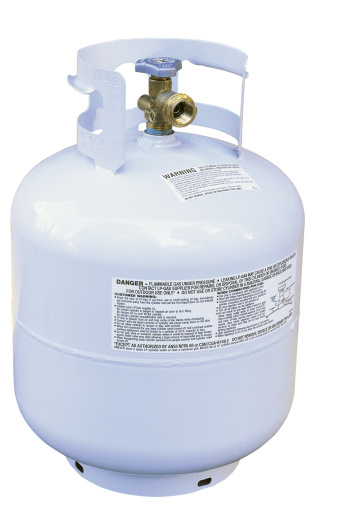 One gallon of propane provides 91,500 BTU of heat energy and weighs 4.25 pounds, which equates to 21,500 BTU of heat energy per pound of propane. If your propane fireplace uses 26,000 BTU per hour, you will get 50 minutes of burn time per pound of propane. You will consume slightly over a third of a gallon of propane per hour, or 3.5 hours of burn time per gallon of propane. If your fireplace uses a pilot light for ignition, that flame will consume about 600 BTU per hour or 14,400 BTU per day, which equates to about a gallon of propane or about 4 pounds of propane every six days. At a consumption rate of 26,000 BTU per hour, your 100-pound bottle will fuel your propane fireplace for about 84 hours, equivalent to 3.5 days of continuous 24/7 operation. If you use your propane fireplace for two hours a day, seven days a week, the 100-pound propane bottle will fuel your fireplace for almost six weeks. If you used your fireplace four hours a day, the bottle would last around three weeks. Likewise, if your fireplace used 52,000 BTU per hour instead of 26,000 BTU and you ran it for two hours per day, you would get about three weeks' use from your 100-pound bottle.